I've known of Natalia for a few years now through mutual friends, she's an amazing make up artist and kindhearted human. 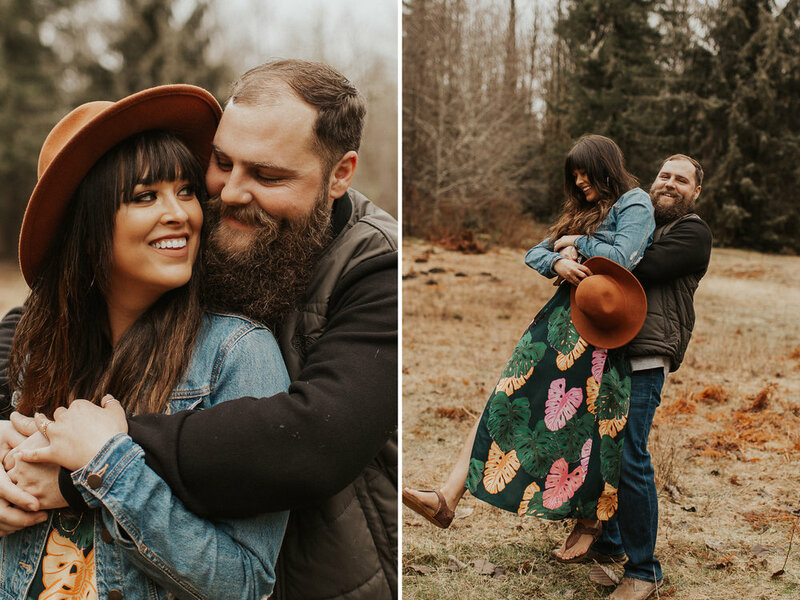 When she reached out to me about her engagement photos, she mentioned wanting hawaiian vibes as they are getting married in Hawaii this upcoming summer. The entire week before their session, and entire week after this session is PNW poured all day every day. You won't find many palm trees in our neck of the woods, sure theres some beaches but with the weather we decided to keep it local and see how it went. We totally beat the rain this morning, grabbed a cup of coffee, and escaped to a local river spot (not exactly tropical BUT almost as close as you get to it where we live!) These two are total babes and despite telling me they were going to have no idea what they were doing in front of the camera, I think they totally nailed it. I don't mean to play favorites, but whenever a couple brings their dog along- I melt. Scroll down and you'll meet their pup, Dirk. See Dirk is an old man, and he wore his finest old man hawaiian shirt for this occasion. Dirk was a trooper, with his little legs he climbed over rocks twice his size and was always down to do whatever I asked of him for the photo. These three were so much fun to hang out with and I can't thank them enough for letting me capture them!